The Permabond range of anaerobic adhesives is formulated to provide superior performance benefits in applications with self-supporting or closely-mating metallic components such as retaining bearings, threadlocking, flange sealing, gasketing and sealing pipe work. How do Permabond anaerobic adhesives work? • Enhanced torque resistance over mechanical joining. • Greater design freedom through possibility of joining dissimilar materials. Prevail (N.m) in.lb Service Temp. • Fast cure speeds for quick pressure testing. • Dismantleable and permanent threadlocking that increases project versatility. • 100% leak-free seal, even with mis-threaded fittings. 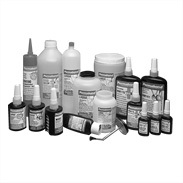 • Wicking sealants to penetrate tight fitting or pre-assembled parts. • PTFE based formulations for durable, long-term sealing. • Inert cured material; resistant to acids, solvents and glycol based products. • Multiple viscosities; to seal both fine and coarse threads. • Fast cure speeds for quick pressure testing; instantly sealing to 1000psi (70bar). • Dismantleable and permanent sealants that increase project versatility. • 100% leak-free pipe sealing even with mis-threaded pipes. • Final cure strength that exceeds that of most pipe materials. • Fast cure and high strength that eliminates flange re-tightening. • A full range of viscosities for various gap-filling requirements. • High-temperature resistant products available. • Dismantleable and permanent gasketing grades,expanding project versatility. • Excellent flexural and vibration tolerance with no loss in seal integrity. • Liquid adhesive provides greater surface-to-surface contact than mechanical fasteners. • Quick curing without air; accelerates assembly rates. • Resistant to oils, solvents and other surface treatments. • Available in permanent and removable formulations. • Wide temperature range; from -50 to +230C . • Gap fill capability from interference fits up to 0.5mm . • Seals, bonds and locks with one product.